6,433 COLOURlovers viewed this page and think sugary has rocked the world. OMG I saw a skirt at the thrift store that had almost this exact print, (it was different) unfortunately it was too small for me. :( CUUUUTE! So pretty! Love the sketchy feel of it! 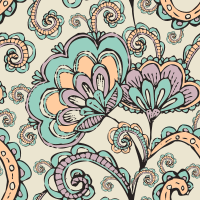 For some reason, this pattern reminds me of Dr. Seuss books. I guess it's the way the lines are drawn. Beautiful! Is the title a reference to Wordsworth's poem?